Can't get enough of Facebook? 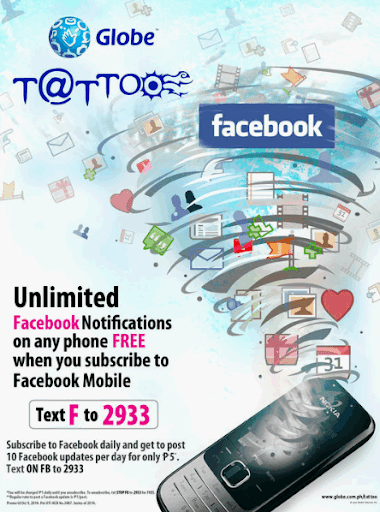 Receive unlimited Facebook notifications on your Tattoo mobile phone for FREE! 1. Text F to 2933 for free. 2. You will then receive an SMS with your confirmation code. 7. Choose "Already receive a mobile confirmation code?" 8. Enter the confirmation code in the text box provided then click on Confirm. Note that receiving notifications is free but updating your Facebook status, leaving comments, sending messages and poking a friend cost Php 1.00 each. Text < MESSAGE > to 2933. Also, you may get daily subscription of 10 outgoing messages for just Php 5.00 per day. To register, simply Text ON FB to 2933. After you've exceeded 10 outgoing messages, you will be charged Php 1.00 for every succeeding message. Please read full terms and conditions and FAQ's on this promo via this link.